It’s no secret that I love high quality power tools. I know the big names and as I’m slowly building the tool collection in my DIY workshop, I tend to check those out first. 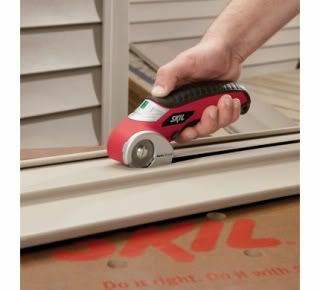 That’s why I was very excited that the fine folks at Skil sent me their new Skil Power Cutter for review because up until now, the only experience I’ve had with Skil brand power tools is drooling over their XBench Portable Workstation in the hardware store. Unfortunately, the Power Cutter is such a specific tool that I could only use for maybe one or two specific DIY or craft jobs around The Condo, that I can’t justify drooling over it. Maybe you might though. The Power Cutter’s designed to cut material that is up to ¼” thick such as carpeting, vinyl flooring, wallpaper, heavy fabric like canvas, window screens, plastic pond liners, or items that are a little too thick to cut with regular scissors like cardboard, foam core board, or heavy cardstock. I tested the Power Cutter on cutting cardboard, paper, canvas, and a remnant of vinyl flooring the builder left at our house and that I will someday make into a floor cloth. I found that the Power Cutter works best on straight cuts; it didn’t do too well on detailed curvy cuts. The Power Cutter didn’t take very long to charge up and they say keeps it charge up to 18 months (which due to deadlines for this review I can’t test that, so I’ll have to take Skil’s word for it.) That’s impressive because there’s nothing I hate more than to grab a rechargeable tool from my toolbox for a quick DIY task and find that the battery’s dead. The Power Cutter’s a cute little hand tool and I hate to give it a thumbs down, but I find that since very few of my home improvement or even craft projects call for me to constantly or repeatedly cut through the materials the Power Cuttter is designed for I don't think it’s worth the $50 investment. For me, a good utility knife or jigsaw will do just fine. However, if I had arthritis or carpel tunnel syndrome (which may develop someday given how much time I spend typing at a computer keyboard) where I didn’t have the strength or dexterity to use heavy duty scissors or a utility knife, then I’d consider the Power Cutter. Updated Friday April 9, 2010. Hi everyone. Lisa here. I stand corrected on my orginal assessment of the Skil Power Cutter. I used it to cut cardboard for a project and it worked great. So much better than scissors. I was totally wrong on my first assessment. Skil didn't contact me and ask me to recant or detact my orginal review. All opinions are my own and they have changed. I thought you should know. Design Within Reach Black Friday Discounts!